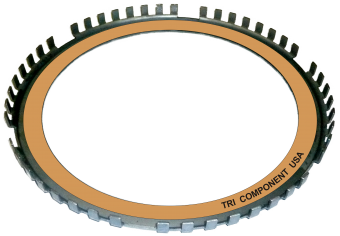 Tri Component announces its patented FX-23-78 converter drive plate for Ford 4R100 and 5R110W. •	Extended teeth overcome fretting of front covers. •	Time saving drop-in part, no machining required. •	Extends service life indefinitely on worn or new covers. •	Noise and chatter are eliminated. •	OE triple lining design is retained. •	Reduces component and core costs. •	Contains Tri Component advanced friction materials.